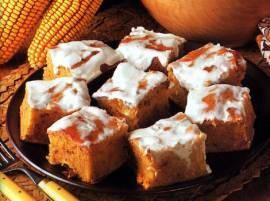 Bazlamaca is an easy to make cake made from corn flour traditional in the north of Croatia. It is healthy, easy to store and can be served as a part of a kid's lunch box. Grease a rectangular heatproof glass pan (such as Pyrex) with cooking oil spray. Heat it well in oven on 200 degrees C (390 F). In a large mixing bowl,beat eggs with milk. Add sugar, lemon zest, oil and flour and mix until blended. Pour batter in preheated pan and bake at 200 degrees C (390 F) for 45-50 minutes. After 50 minutes of baking, pour sour cream over cake and bake for another 10-15 minutes. Cool cake to room temperature and cut into slices. This cake can be served warm or cooled in freezer, both variations are good.